Fraternity formals are just never a good idea. There was definitely some a lot of puking involved. 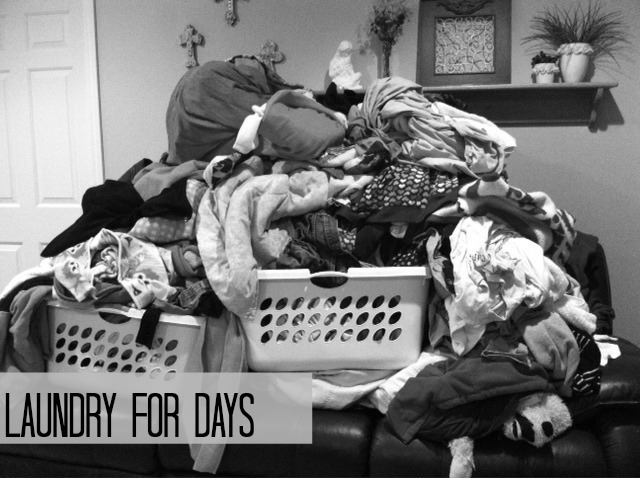 When I lived in a dorm and had to walk down, like, three flights of stairs to get to the washing machines (which required massive amounts of quarters), I would pretty much hold off on doing my laundry for months at a time -- sometimes taking said dirty duds home to do it there instead. 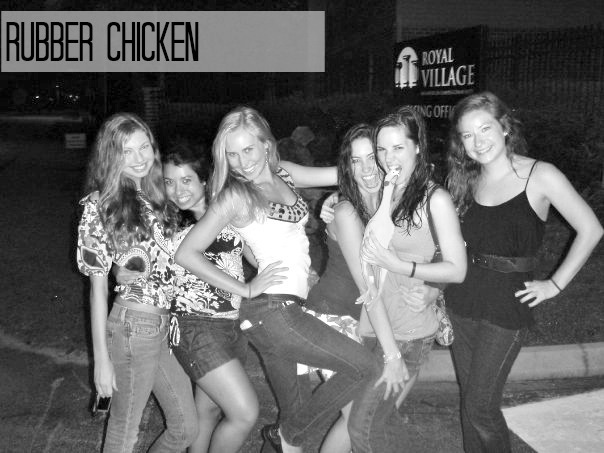 Wednesday night is when college kids get into the world's trashiest strip bar ever for free. I'm still a little scarred by it. Yea, I took this rubber chicken everywhere. It makes THE worst noise, kind of like a narwhal dying a slow and painful death. I think I remember my friends pouring shots into it one time too. So yea. That's just a little taste of the dumb things I did from 2007-2011. And yea, I would absolutely do them all over again. What kinds of shenanigans did you get into in college? Ha ha!! I think your college shenanigans are hilarious :D At least you have crazy, and fun, memories from it! I don't remember saying you could post the details of my college experience on your blog but I'll let it slide this time! :) Love this post, obviously! I am totally loving this. 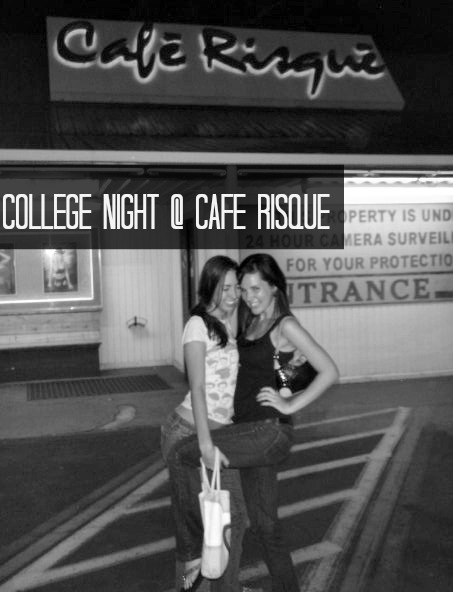 Cafe Risque was once a dare trip! This post really makes me miss college. I did so many stupid things. I often think of all the germs I shared with others over games of flip cup/beer pong and am totally grossed out by it. Funny enough, I never got too sick back then because I was probably exposed to so many germs. Ick! SO - i'm like your elder. which is sad. because i graduated and continue my binge drinking nonsense outside of college just as you were starting. YIKES. i'm old. OH WELL - love you and this college-time craziness that has seeped into real life. 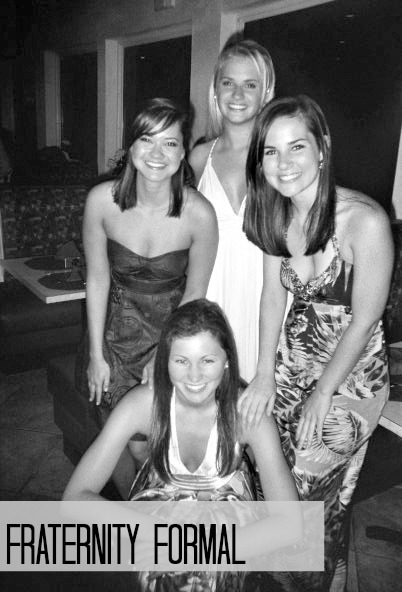 Fraternity formals were always a good idea ... right? Im a new follower and this post is great!! !